In terms of gameplay, 'Ring Shot' mode has been added, tasking players with sending the ball through the rings that appear on screen. This can either be played in co-op, where players will try to keep the ball going in a rally, or competitively, with each player trying to hit the ball through more rings than their opponent. Extra points can be gained by hitting the ball through several rings at once. There's also a special version of this new mode called 'Yoshi's Ring Shot'. In this version, players take on the roles of differently coloured Yoshis, and hitting the ball through a ring of your own colour with quadruple your usual point tally. This mode will actually be appearing as an online co-op mission until 1st June. You can see it in action below. I really hope for a Mario Golf game that keeps on giving like this one here. I played through the story and have never gone back. I keep meaning too as some of the new online co-op missions look cool, I just wish they weren’t timed events tied to online. I’d like them to just be extra modes that stay in the game forever and allow you to play them whenever you feel like it and have time. I’m actually already so fatigued by limited, special event style content in games nowadays. I often just avoid them altogether. So please inform me if I have misunderstood how this extra content that gets rolled out for this game works. Plus, it would be nice to actually get some kind of animation for whatever is supposed to be in the treasure chests you open in the story mode. 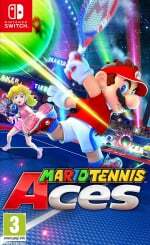 The core-tennis gameplay is great in MARIO TENNIS ACES but I do feel the surrounding game content around it was actually a bit of a let down. I'm really happy this game is still getting updated cause the lack of content was the one thing holding it back, but getting an opening cutscene only now seems a bit strange. That seems like the kinda thing you just have or you don't. I wonder if this game and kirby star allies are worth the purchase now. Both are from a great series but light on content compared to earlier games in those series, if I understood correctly. Was really disappointed with this game. It looked pretty promising and I was looking forward to it, then ended up getting bored of it in a day and haven't really touched it since. The story mode just felt like a chore and the online wasn't much better. Good to see that they're adding more to it now I guess but it's a little too late for me. I don't understand what these updates are for. But still, good for the players. Anybody still playing this on a regular basis? @Lalivero I think Nintendo must have had a contact with Camelot to develop a specific number of features within the game. Whether Camelot didn't finish them in time for release or they were contacted to develop them post release is anybodies guess. I usually still play around 10 online matches a month. In the Uk and don’t have trouble finding matches. @KingdomHeartsFan Given that Aces came out during a slight drought in the Switch's second year and the hate that Ultra got for being bare-bones this makes sense. @bluemujika Good business decision to release it then. I've noticed it's getting a bit drought-like again. I can't even think what's the next big Nintendo release. @bluemujika it would also make sense when you think that tennis games have to be released in a relatively narrow window in the summer to have any chance of commercial success. @KingdomHeartsFan Mario Maker 2 followed by Fire Emblem. This has reminded me though that Mario Golf is a good bet for an E3 reveal. Not inspiring to me but it’s a Nintendo mainstay that’s still absent. I.. might actually jump back in now. Aside from playing the game just the other day with someone because they wanted to see what it was like, I haven't played this game since its launch weekend. @StuTwo Oh yeah. That was it. I don't know why I forgot about them. I LOVE Mario Tennis Aces and still play several times a week. Each update has massively improved the gameplay and I can't wait to try this one out too as soon as I'm home. It's really really good fun. Kinda makes you wish they shipped this as a completed game huh? They should've waited until all of this new stuff was added in. I'm starting to have great distaste for games that sell incomplete and then gain free DLC over time. It was fine with Splatoon I guess but then Arms, Kirby, Smash and this game followed it. Simply put, it's getting annoying. @StuTwo So close to four months until another Switch game that interests me comes along, assuming no delays. Smash must have been my last Switch game I bought. I know other games have been released between then (though Yoshi is about all that springs to mind) but it's starting to feel like the beginning/end of the Wii U where there was barely anything for months on end compared to the mid life where it was like "BAM, NEW RELEASE! BAM, ANOTHER! WHOOSH! HERE'S ANOTHER NEW GAME!" Nintendo is doing the approach of "release first, finish later" the right way. While companies like EA and Bethesda, release incomplete, buggy games that look like Early Access, treating players who buy the game at launch like beta testers, Nintendo releases a game that is worth paying $60 at launch, and will get extra content that couldn't be added during initial development for free. An another thing, when Nintendo is going to make a new Wario Land game, with Waluigi as the co-op partner? @AlternateButtons Smash is complete. Yeah theyre adding some new characters and stages, but meh. It's a very meaty release. @AlternateButtons Can't speak for Kirby, Arms or Mario Tennis. Splatoon I always get late. But even before significant DLC added, the game felt complete. Smash? I don't know how anyone can suggest a game that stuffed is incomplete. So was anyone holding off buying this until they added a Wario & Waluigi intro scene? Even just a port of the fantastic 3ds game would be good for me. @Lalivero I'd be happy to find a game that's feature complete on day one these days, with no DLC money squeezing afterwards. Strange that it's an exception rather than the norm. @victordamazio Gonna disagree on the "worth $60 even from the start" part, but the rest of that is a good point. Even when Nintendo releases a game that's missing important pieces, it's still a game that runs and plays well at heart. @Semudara Yes, even if the game was missing content at launch, at least the game plays without major issues and it's mostly free from bugs, you're not being a beta tester for buying at launch. @Tao Come on - there was never a point in the Wii U's lifespan where great games were released month after month BAM, BAM, BAM. Maybe the odd year when we got 2 great games in quick succession in October/November. I definitely feel like Switch has delivered high quality games on a much more consistent basis. We've just not yet felt the full force of big first party releases that we were all hoping to see. If nothing else though we do get every big indie game now (and often targeting Switch first) whereas in the Wii U era it was always touch and go if we'd even get games like Axiom Verge. Hopefully the next direct will hit upon Mario Party updates! I love the game, but after a bit..... It needs more games on all modes. Just remake old minigames from past games and boards and BOOM, profit. But Mario tennis is still fun, and surprised that they change everything, bit really great. Wonder what new characters are next. I hope Mario Kart 9, Golf, Party, and other games follow this trend (not the bare bones release, but continue to add new content with new characters, modes, and stages). @SetupDisk Or even a remaster of the excellent Nintendo GameCube game! As soon as they replace the amateurs doing the music for Mario Tennis, I'll get one again. Why does it have to be so bad and 'hyper children party' like. Same goes for Mario Golf. Just get the guy from Pilotwings even. once a month or so, i go in, try to get the rally points against those stupid boos, fail (even in "all out mode"), and put the game down for another month. @StuTwo - While not month-after-month, to be fair, in 2014 we got DKC: Tropical Freeze, Mario Kart 8, Bayonetta 2, Hyrule Warriors, and Super Smash Bros for Wii U, along with indie games like Shovel Knight. I think that's what he means when he refers to the 'mid period of the Wii U'. An opening cutscene a year after release? Really bad work ethic. @Lalivero I was wondering the same thing. I'd happily pony up for some extra boards/characters/game modes. I want a game starring Wario + Waluigi. All of this should have been there since day one. They should focus on a new Mario Golf, and release it when it's actually finished. @Lroy agreed - I’m not interested in times events, give me something permanent. @BenAV The story mode was a massive disappointment for me. I was expecting to be like the story modes we had for the GBC and GBA versions, but what we got instead was just a grind to unlock content where you had to take on ridiculous boss battles and mini-game challenges most of the time. If they made it so you were just, you know, playing tennis against normal opponents like the GB versions it would have been really fun, but they sucked all the fun out of it with the constant challenge mode nonsense. Why doe this mediocre game get regular updates?????? This game has gotten so much more support than Mario Party. Just give me the N64 game with updated graphics and online. They nailed the gameplay back then. If they have time to add more characters then fine. This is Nintendo testing the digital-only future little by little (not only Nintendo, other companies are doing the same). Things like releasing a barebones game on physical and requiring heavy downloading of updates, patches, and content, train the userbase into thinking physical is useless and cumbersome (when in reality it can be the opposite). Timed events also, make the user feel the fun content is out there "on the cloud" and not inside their stored media. Wow, is this a first for Nintendo? I find it really bizarre for a game to get an update for an opening movie. They should've done this for Smash 3DS! Honestly 20 years from now, what exactly are you going to do when you realize you have an unfinished game and no way to access the eshop for these updates? There will be piracy I guess, that's pretty messed up and one of the reasons I dislike "modern" games.